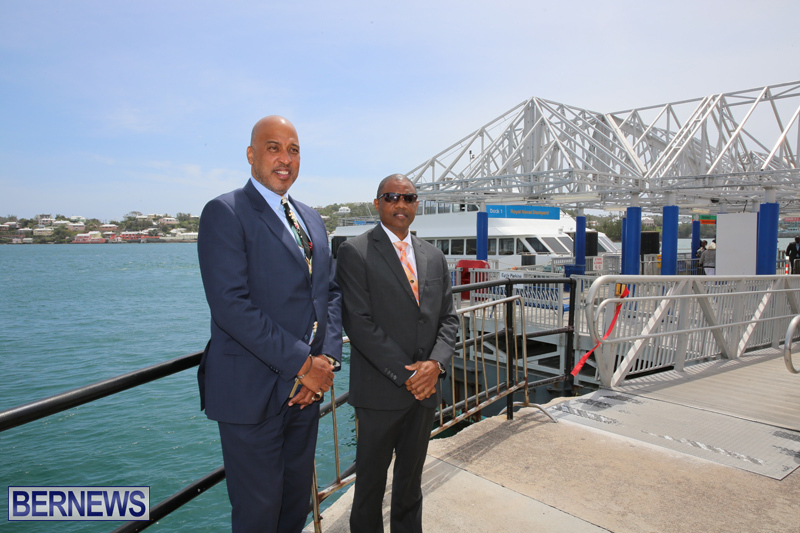 Minister Simons said, “A Government capital injection through the Ministry of Tourism, Transport & Municipalities has led to an aggressive maintenance and repairs program on Government ferries. “As a result, the Department of Marine & Ports Services is on schedule to have the strongest ferry fleet this summer in many years. “Staff at the Department of Marine & Port Services are to be commended for working beyond the call of duty to get all the available ferries ready for the summer. “The Department has today released its summer schedule which begins April 24th. “In addition to the regular routes, another schedule is being created for a dedicated America’s Cup Village ferry route to provide fast, easy and direct transportation for the convenience of America’s Cup ticket holders. “The dates and times for the America’s Cup Village ferry will soon be released with the AC35 online booking system. “On weekends, the schedule includes 5 trips to the America’s Cup Village during the three hours in the morning before racing begins and an equal number for the return to Hamilton. It also provides direct ferries from St. George’s to the America’s Cup Village on weekends. “Some 2,500 people will be ferried to the America’s Cup Village from Hamilton on weekends, and 500 people from St. George’s. 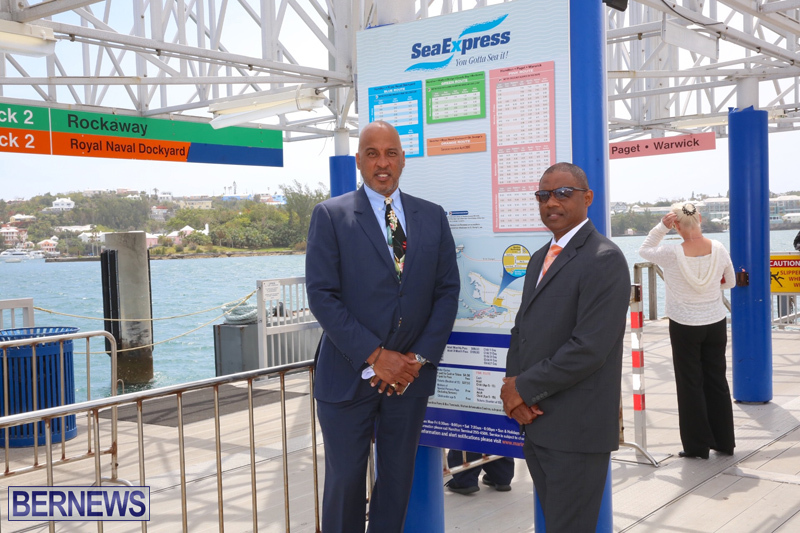 “The Government recognized that Bermuda’s beloved ferry service had only five fully functioning ferries, putting a great deal of pressure on many of the Marine & Ports staff. “We committed more than $3 million to bolster the department and we found that mechanics and other staff rose to the challenge. Many worked long hours to get these vessels ready. “They are doubling our available fleet as we expect to have ten full time vessels in service this summer. That should provide the capacity we need to service our regular routes and the special routes for the America’s Cup. “Today, they have 70% of the required maintenance and repairs completed. A further 20% is on schedule to be finished before the start of our summer season on April 24. The remaining 10% will be concluded before the start of the America’s Cup event to provide the required passenger lift for the 2017 summer season. “Out of the $3.2 million provided by Government, some $2.5 million was committed directly to ferry maintenance and repairs. The remaining funds were allocated for Tug Boat repairs. “The dedicated express ferry to the America’s Cup Village is the recommended primary mode of transport for the event. It relieves road congestion and will be the fastest, most convenient way for spectators to get to, and from, the races. “Marine and Ports Services has been actively working with ACBDA – the Bermuda team of organisers for the America’s Cup – to deliver efficient transportation for America’s Cup spectators. Only thing they have tugged in years sits next to North Rock. So we do not need them? Is that what you are trying to say? Should the tug boat industry be privatized? Thanks to America’s Cup, our roads are being paved all at once for the first time, our internet is being boosted, our agriculture is being managed, ferry fleet upgraded, Horseshoe Bay getting a facelift, etc, etc. Kinda reminds me of someone who ONLY cleans their house when they expect guest. Not a bad idea. Right now crews sit around doing nothing. Doing anything else besides crewing the tugboat is not their job. Would be great if the St. David’s/St. George’s Commuter Ferry could get back on schedule leaving St. David’s at 7:25, St. George’s at 7:30 to arrive in town about 8:30 and Hamilton at 5:15pm. Many travelled to and from work which proved very popular and convenient. Might make a little more sense to reinstate that but leaving from Kindley Field….I think there is some talk about building something in that area already. It would be less weather dependent for sure. We are building a Superyacht tender berth, commoners won’t have access. @Sage, are you serious. We are building a superyacht tender berth, commoners wont have access. They are berths built to accommodate Superyachts – fool. Just like cruise ship piers are built for cruise ships, Ferry Boat Docks are built for Ferry Boats, The T-Dock and I-Dock in Flatts were built for small motor yachts. I’m not surprised though. You suffer from that 14 year virus called “self of entitlement”. Me, me, me , I , I , I . Make others pay more so I can pay nothing! It’s already in the pipes because the election is coming. Why did we have to wait for the americas cup for this? Do they do not care about its state until the guests arrive? They obviously do but want to make sure it’s in tip top shape for when guests arrive. How can you not understand this?! They do care about its’ state but they have to prioritize when money is tight. They do not get big expensive cars, they eat at home, keep clothes and the kids and food on the table. It’s called election year 2017 + America’s Cup! Ask the last Administrations Transport Minister. He is the one who bought boats that are not really suitable for Bermuda, at no small expense, then failed to keep up with the maintenance. Maybe because it’s like why we traditionally paint our houses just before Christmas ? We want to make a good impression for all the anticipated guests . Because the government is finally not completely against the financial ropes for the first time in almost decade. We didn’t have to wait for AC but knowing the poor state that the economy was left in, I’m sure you can understand why t hasn’t been done sooner.However, had the influx of Tourist (and money) not happened because of the AC it would be unlikely that it would be happening. Our country, our people, hotels, transporatation, restaurants, entertainment, beaches and more will be on show for the world to see. I am proud (and always have been) and excited to show off our home to the world. Step forward local entrepreneurs to provide exactly that service. There lies a very big problem. Boats, more specifically boats licensed & insured to carry passenger & skippered by qualified skippers are needed to move people from anchored boats to shore points, the AC village in particular. ??? 400 hundred boats carrying 4 people each? Every boats going out every day? I don’t think so . People have lives , work and other interests. The “the plp did it” excuse is finished. The OBA need to prove to me that they know what’s good for the people. The austerity measures they put in place didn’t lower the debt at all. They came to power with us 800 million in debt and now we are 2.5 billion in the hole. They doubled the debt. They made promises they can’t keep (2000 jobs anyone). I will need some serious convincing to vote for them in the coming election. uh, no…your plp math is showing, and you look stupid. Why can’t you people be honest…everyone else can see what a disaster they were. They tried to get approval when we held our last major international spectacle but Beyoncé was not generating enough foreign currency to justify the expenditure. Well that is what I heard. Perhaps another reason is that through creative financing we are able to get some of the things we want despite being only barely on the road to recovery after 15 years of squander. All kinds of stuff Wassup, keep asking these tricky questions. We like that. But how about getting the shelter back over our heads? Too funny. Stood at Hamilton ferry dock now. Just been told that the regular ferry is having issues and that a boat from Dockyard will leave soon to pick us up. 30-45 minute delays all round! Sweeet! How about some of this effort towards fixing the present sad state of our buses? This may or may not get read by the appropriate but. Down at the marine and ports in Hamilton where the ferries berth, why cant that be a regular stop. Where passenger’s can board or depart from there? You have quite a few building at that end of town now, even if you only did it during the peak/summer months. We should have an AC every year, just think of how much will get done. We should have competent people running M&P. Imagine what should be kept in top shape will be kept in top shape. In addition to AC maybe the difference is that for the past few years we have had Transport Ministers who have chased after the M&P brass to do their jobs. 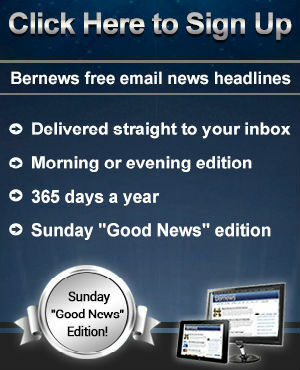 remember when…plp was in charge? these vessels were at the docks with trash piled up in them…literally…didn’t have the money to maintAin them..
You mean like the present state of our buses? The junk ferries we had were replaced with cat ferries and upgraded ferry docks – despite the (some)public outcry. The buses use to congregate around city hall car park – but now have a home in the city. Dockyard was never able to hosts cruise ships and their passengers. And Hamilton & St Georges died at the expense of Dockyard. No small ships, somebody said. You could shoot a canon down the Front St sidewalk in the middle of the day & not hit anything. Doubled the fleet and still no commuter ferry for Hodson’s and Lower ferry. It was not too long ago there were 3 commuter ferrys on the morning at those stops, and it went to zero with no notice at all. In fairness there used to be many hotel & guest house properties along the Paget Warwick shore feeding those ferrys. 3 of them at Salt Kettle alone. Now there is one remaining. At least 3 feeding Darrells Warfe. Now there are none. Nothing at Belmont. Platinum Period. Plutonium Period more like it. Years ago we had to plan our journeys. Today you b!%@h and moan when your skateboard won’t start when on your way for a 100 yard walk to the Ferry. What’s worse is when the bus don’t run on Harbor Road. Don’t worry about global warming and rising tides.